This workshop is open to all media*. 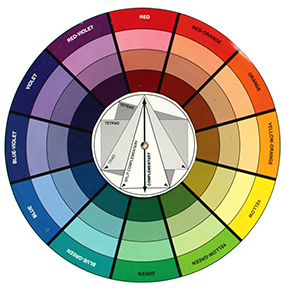 The principles of Color theory and working in color scheme is applicable to all media. I work mostly in acrylics and oils, and my presentations will be examples of paintings created in that media. The basic colors listed below are useful in providing a wide range of hues. They make up a “Split Primary Palette”. Please feel free to use any additional colors you like to use. *Note: Those working in dry media - pastel, oil pastel, colored pencil - will need to adapt the color mixing instructions to suit layering techniques in dry media. Optional colors: Cadmium Orange, Dioxazine Purple, Alizarin Crimson, Sap Green, Green Gold, Burnt Sienna, Burnt Umber, Yellow Ochre, Teal, etc. 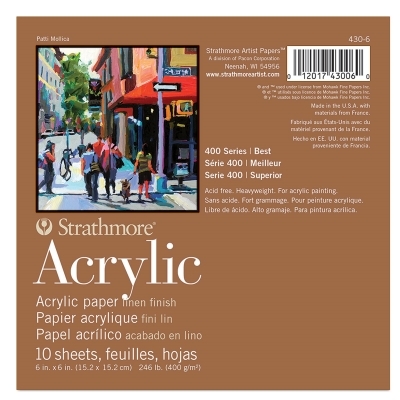 Paints: I use Golden Acrylic paints - they are an excellent quality professional grade paint. You can buy student grade acrylic paints, which are much less expensive, but they dry dull and more transparent because there is less pigment in the paint. For Oil paints I use Williamsburg Paints, and sometimes the Holbein Duo Aqua Water Soluble Oils, which clean up with water instead of solvents. Acrylics: If you are want to work with slow drying acrylics, you can try Golden’s OPEN line of paints, or any other brands that dry slowly. When I don’t want to be “rushed” I often use OPEN Paints, which dry much slower than the regular “fast drying” acrylics. Open Medium by Golden can also be used, it is a slow drying medium. This is a retarder that, when added to OPEN paint, helps it to maintain its slow drying time. If you use water as your medium, it will make the OPEN acrylics dry much faster. Oils: When working with oils I use a medium made of one part stand oil mixed with two parts turpentine (or odorless mineral spirits such as Gamsol). Commerically prepared oil mediums are also available. I clean my brushes with Gamsol or Turpenoid. Higher quality brushes for acrylic AND oils: My favorites are Princeton Aspen and Princeton Catalyst Polytip Brushes. These are more expensive but excellent quality, and will hold up over time, (unlike the Loew Cornells). They have a wonderful spring and retain their shape after repeated use. I use all sizes, and they come in all shapes, I prefer flats and use sizes 2,4,6,10,12, 16. 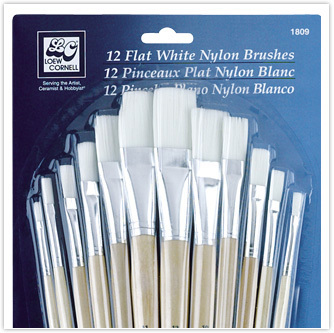 The Aspen brushes are very similar to Silver Bristlon brushes, if you have ever used them. Very responsive to the touch! I love their chiseled shape which tapers in to create nice crisp edges. Feel free to use whatever brushes you like most or have on hand. I suggest inexpensive canvas boards. However you can work on any surface of your choice - stretched canvas, Ampersand Gessoboards, gessoed heavy WC paper, or Strathmore 400 Series Acrylic Paper (right). I suggest a variety of sizes, 8x10 to 12x16”. There may be times you want to paint one painting per canvas, another assignment you may want to group 4 paintings per canvas. Its best to have several sizes and formats on hand to allow yourself flexibility. Also, better to have too many canvases than too few. In general, work in a size that is most comfortable for you. If you work on a heavy watercolor or acrylic paper, you should first coat it with a couple of layers of gesso so that your paint doesn’t “sink in” and look drab. You will want a surface to mix your colors on - glass, or palette paper or freezer paper that you can get at the grocery store. Many acrylic artists use a Masterson Palette box so their paints stay wet after their painting session.